In this edition of the Technology Solutions Guide series, CGT presents a comparison chart of product information management solution providers for the consumer goods industry. 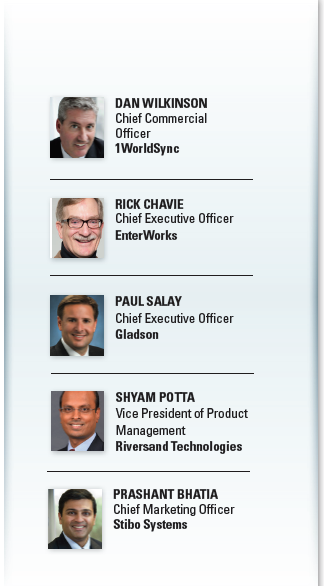 Plus, experts from sponsoring companies 1WorldSync, EnterWorks, Gladson, Riversand Technologies and Stibo Systems provide thought leadership for product manufacturers that are navigating the challenges and opportunities surrounding effective product information management (Download the full PDF of the 2017 PIM Guide, including the comparison chart of solutions). CGT: Is the practice of managing product information across the e-commerce landscape getting any easier? WILKINSON: 86% of companies want to excel at customer experience. But only 27% of brands qualify as “good” in the eyes of their customers, according to Forrester. Today’s consumers expect retailers to address their needs in real time when they’re contemplating a purchase. A wealth of information is a tap away via our smartphones and a poor experience is replaced with another viable option a click away. Between authentic reviews and product photos, consumers demand exceptional experiences universally. Managing product content has never been easy, but the highly competitive nature of today’s market and the complexity of global product sourcing doesn’t help. Fortunately, large-scale initiatives like GS1 standards and the cloud are helping companies. Despite multiple solutions, there is still work to be done. Companies are striving for the right balance between an online and physical presence. It is important to implement systems that offer speed to market and are data governance-friendly. Embrace data discipline (without which, content is not consumable). Centralize for a single view of omnichannel content. The only software tools supporting “consumable” narratives are the ones that unify data, digital assets, and product storytelling in a single platform for product information, master data for brand and customer, and constituent portals. SALAY: In the short term, it’s actually getting more complex: Before we can discuss e-commerce, we need to acknowledge evolving retail outlets, new private label retailers, evolution of label standards, and a consumer desire for greater transparency and trust in product information and where it came from. Now let’s bring e-commerce in the mix. We are seeing a combination of “pure” e-commerce, hybrid click- and-collect programs, and consumer showrooming (or web-rooming, where they see something online and buy in a store). We’re all living through a significant evolution of the market in which technology and transparency have forever changed the consumer’s path to purchase. This change is driving great marketplace interest. Better platforms, SaaS and new technology players are improving speed and flexibility. The upside is that we are able to better integrate into these various systems. The downside is that an overzealous focus on technology can obscure the fact that product content isn’t always thoroughly reviewed for quality, which impacts the retail channel and, ultimately, the consumer’s purchase. POTTA: I think it is only getting harder for multiple reasons. For one, the trends around volume, variety and velocity of data are making the problem more difficult by the day. For another, these trends are changing faster than the rate at which the e-commerce and data management tools can adopt, are ordered, produced and delivered. BHATIA: The dissemination of information is certainly easier today because there are more tools and standards that help companies simplify the sharing of high-quality, standardized product data and let them do it faster and more efficiently across not only the e-commerce landscape, but the entire enterprise architecture. This increased maturity of e-commerce, combined with the fact that the quality of the tools available in the market today has evolved to support all facets of managing product information, allows companies to change how they manage their e-commerce strategies and develop a sense of industry best practices and knowledge sharing. Companies that are new to e-commerce can leverage all of this knowledge in building their strategy by gathering information from peers who have already gone through the process and learn from their experiences. CGT: Are retailers developing more effective systems for data sharing and management? WILKINSON: Successful collaboration between recipients and suppliers has always been complex, and with the proliferation of increased online presence, it has been even more challenging for suppliers to keep up with the changing demands of recipients. Retailers typically develop some sort of portal for suppliers to input data. Retailers who have implemented GDSN are not an exception. There is still additional information required for suppliers to complete item setup. For example, Amazon has Vendor Central and uses one-off spreadsheet formats for item setup. They are now starting to implement automated processes for item setup and there is considerable effort being put into improvements in data sharing and management. CHAVIE: Retailers and brands have often focused on putting enterprise and mobile commerce platforms in place before getting their data in shape. What they all experience is the shock of shoddy data that needs continuous correction. Once consumers are exposed to low-quality content, their trust in both the manufacturer brand and the retailer brand diminishes in lockstep. Out of necessity, collaborative processes are being put in place across constituents in the content value chain. Among them are vertical-specific, standardized data pools sponsored by industry groups, who realize that having point-to-point connections between individual manufacturers and retailers for conveying customized product information is not scalable. The platforms that have emerged leverage unified content platforms that are rooted in dynamic data modeling and data mastering, which helps companies adapt and yet remain compliant in the face of consumer demand for continually refreshed, accurate and dynamic content. SALAY: Retailers are often hesitant to share much internal information given the extremely competitive marketplace in which they operate. However, we have seen with valued partners an openness to work together to come up with more efficient solutions once you earn their trust. Manufacturers are starting to think more broadly about sharing content given consumer access to information and the desire for transparency. We think this will continue as systems and platforms evolve to integrate with multiple partners. You only need to look at the recent combinations of Walmart/Jet. com and Amazon/Whole Foods to see the potential for marrying great distribution with systems and data. This also demonstrates the importance of technology in maintaining a strong market position while looking to grow. POTTA: There is minimal awareness in the industry that retailers need to become more collaborative rather than maintain traditional hierarchical/bureaucratic methods. The trends in data — the 3 Vs: volume, variety and velocity — is forcing companies to realize this gap. However, technology choices, along with archaic implementations, prevent companies from being agile and more collaborative. There is also a fear of “losing my niche” if this kind of change must be adopted. BHATIA: While the collaboration between retailers and consumer goods companies has increased, there are still significant challenges faced by both sides. Manufacturers can no longer create their own template for data capture, since retailers require vastly different data sets. This presents a significant challenge for manufacturers to provide high-quality, updated data in a timely manner. However, retailers agree that data syndication and a standardized data pool (like GDSN) are valuable in getting high-integrity data when they need it. Retailers are now beginning to provide robust, user-friendly systems to upload, onboard, and manage product data. Despite these improvements, each retailer still has different processes and systems to accomplish product onboarding, and the standardization of the data required from the manufacturers is lacking, challenging manufacturers to find a way to “keep up” with the retailers’ requirements. However, the gap is closing and the collaboration and systems development between companies has certainly improved. CGT: What methods are consumer goods companies using to measure the effectiveness of their PIM efforts? WILKINSON: In the absence of a PIM, 90% of spreadsheets have errors — which results in a cost of $10,000 to $100,000 per error per month, according to Bloor Research. Looking at a use case, Reynolds Consumer Products was faced with the challenge of commissioning an existing PIM that would no longer be supported and needed a new system that could replicate the functionality of its existing solution, provide more robust integration and workflows, improve validation and messaging to streamline troubleshooting, and syndicate data across a vast omnichannel ecosystem. Reynolds selected a new solution for product content management and picked another for data aggregation, validation and syndication. The company achieved results including item setup reduced to minutes, realized annual savings, a 90% reduction in re-work, and improved confidence. Reynolds learned the following best practices: understand the costs, engage resources, educate leadership, invest in people, standardize processes, leverage technology and prioritize data governance. 1. Competitive content comparisons on images, attributes and descriptions for like products, whether through web-scraping or promotional flyer comparisons. 2. SEO: If a product cannot be found on the web, you can’t sell it. This is true not just for web retailing but for physical store selling, since web research increasingly dictates choices. 3. Breaking through the retailer’s content barrier. A brand may create wonderful content, but if it doesn’t find its way onto the retailer’s website, it is all for naught. 4. Mix of user generated content. While consumers are not as controllable and on message as centralized brand marketers, the failure to generate buzz from the word of mouth of friends and family is deadly to a brand wanting to rise above the digital content clutter. The best content practice? Test. Learn. Try again. SALAY: True PIM effectiveness comes from integrating content across both e-commerce and in-store platforms. This ensures that retailers have current information to manage their systems, helping prevent out of stocks in-store and giving consumer consistency across shopping channels. We have learned a few lessons for implementing a successful PIM program. One practice is to create a central location to house all product content for access by all departments, which provides consistency while eliminating redundancy — thereby saving time, space and resources. Another successful practice is to implement processes to manage and maintain both new product additions and existing product validation. This can lead to increased revenue by bringing new products to market faster and retaining your shoppers. Finally, including marketing content and enhanced product attributes are the “added value” that a PIM system can provide. When brands provide access to this enriched product content, their partners can implement more consistent programs to help drive web and in-store traffic, increase customer awareness and grow sales. POTTA: Measuring the effectiveness of a PIM implementation is still evolving. This is one of the apps around analytics and insights we can build to help identify the dent certain aspects of data quality have made to the overall top line or bottom line of a consumer goods company. From there, we could extrapolate and help assess the impact that improving the data quality or the data management process will have on the enterprise. breaking data management into smaller, more manageable programs that work together. having mature data governance processes in place to enforce quality throughout the enterprise and disseminate product data with higher velocity and frequency. implementing a robust, scalable PIM system that provides data quality tools, workflow capabilities, and easy-to-set-up integration frameworks. focusing on enterprise-wide user adoption by selecting an easy-to-use system. embracing GDSN standards, which allows manufacturers to apply data governance principles across the enterprise. Ultimately, a PIM’s effectiveness is measured not only by its ability to aggregate data, but also by its ability to cleanse, enrich, and categorize data quickly while being able to pivot quickly in ever-changing environments.